Although Canal Street has been in flux, it remains the discount mecca for New York City. Here you can find a myriad of consumer items at tremendous discounts. The streets are lined with shopping stalls packed with merchandise. 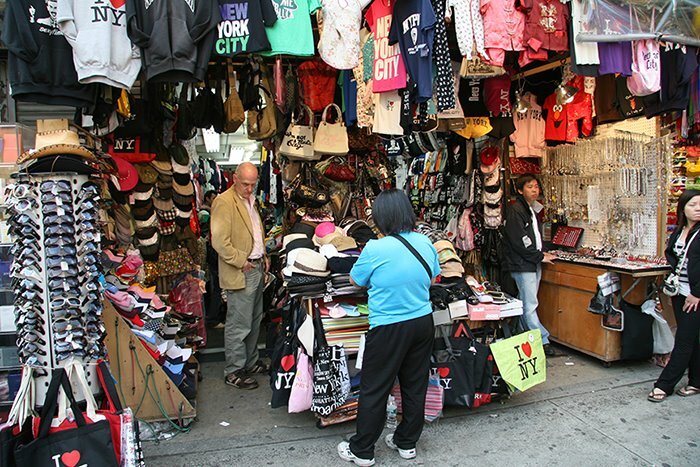 Unfortunately for manufacturers of top branded items, this area of Chinatown around Canal Street and Broadway is also the mecca for fakes and knockoffs. Trinkets, baubles, tourist T-Shirts and tacky NYC memorabilia are mixed with fake designer watches and designer bags. This is where Prada, Gucci or Coach bags can be found for a small fraction of their normal retail price. Or Rolex watches for a few dollars. There are stories of back rooms and underground chasms where serious customers are led for counterfeit treasures - read an article about this here. Crackdowns and large scale arrests are made regularly - particularly targeting the importers and larger operations. But, the pirates are tenacious and the cat and mouse game continues. I can't speak to the quality of these fakes. I have never really partaken in these goods - my purchases have been confined to discounted legitimate products like Casio watches, durians or shopping in a places like Pearl River Mart, Pearl Paint, Space Surplus Metals or Canal Rubber.